INCAE was once again recognized by the Financial Times by ranking 11th in the annual ranking of business schools in the Americas published on December 3, 2018. Other schools in the ranking include top universities such as Georgetown, NYU, the University of Virginia, and Cornell. 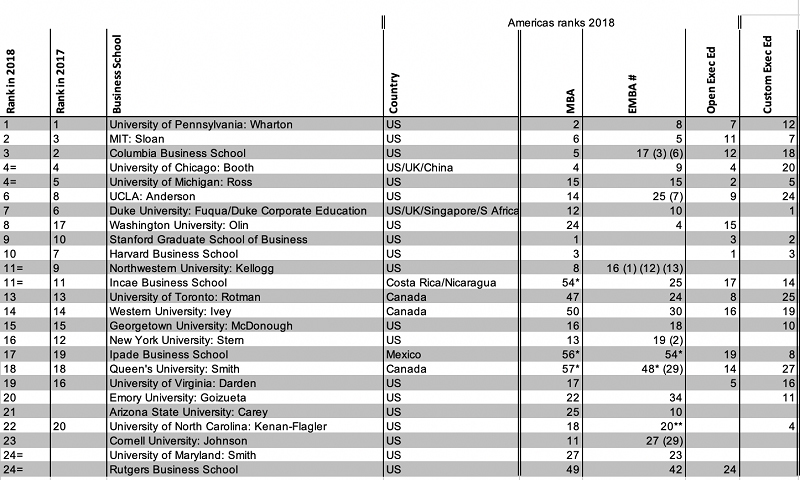 This is the second year in a row that the Financial Times publishes this exclusive ranking of the best 25 business schools in the Americas measuring individual programs’ quality and breadth and evaluating the performance of each school in MBA, EMBA, Open and Corporate Programs. INCAE remains the top business school in Latin America in the ranking comprising 20 American, three Canadian, and only two Latin American schools. "Thank you very much for trusting us. This piece of news encourages us to continue innovating our programs to offer the highest possible level of learning to the leaders that will transform our region. We are honored to close the year by sharing this excellent information," said INCAE Rector Enrique Bolaños. As the best business school in Latin America, INCAE has promoted progress in Latin American societies by training talented regional leaders through Full-Time Master’s Programs, Executive Master’s Programs, and Executive Programs for more than 50 years. For more information please contact INCAE Communication Coordinator Susan Fernández, susan.fernandez@incae.edu – phone (+506) 2437-2177.